Peganum harmala is a perennial shrub with fleshy spikey-looking leaves, growing up to 1 meter tall. Its small, brown seeds contains harmine and other harmala alkaloids. 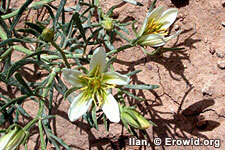 It is one of the plants speculated to be the Soma or Haoma of ancient Persia. What is the difference between "Rue" and "Syrian Rue"?